My company's new online virtual world for kids is now live at www.supersecret.com. Wonderful article by Michelle Slatalla in the NY Times about the new DNA genealogy service from Ancestry.com. My team at ProductCore designed and built the service for Ancestry. It was a design challenge to provide enough depth in the service to satisfy the hobbyists while keeping it simple enough for regular folks. "We’ve forgotten Microsoft Bob, we’ve forgiven Microsoft .NET, but how on earth can we decipher Microsoft Windows Live?" 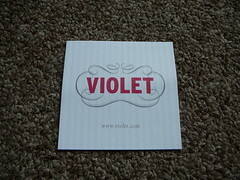 More good blog-press for Amy's gift site, Violet.com.